It’s tough to imagine being a pioneer when this nation was just beginning and the North American landscape was cloaked in thick ancient forests. Navigation must certainly have been a real challenge, with heavy reliance on sun and stars, rivers and mountain tops. Finding one’s way from holler to holler in the uplands of the Virginias required clever devices if people were going to find their way to and from homesteads. The blaze was a common solution. A modest swath of whitewash on the trunk of a tree heartened many wandering souls, who could follow each successive blaze to their destination. If for some reason you find yourself being held down by one of the many boulders out in PCNA or any other emergency that would warrant a 911 call, scout the nearest trail blaze and let them know the letter or trail name and the number – help will find you quickly, and odds are you’ll be glad very grateful it did. The SMGA trail crew developed the system and, with the City of San Marcos Park Rangers and assistance of police, fire and emergency dispatcher, helped install them. Ever wonder where Critters’ Hall is? Check out D-156. The trail names will appear on SMGA’s upcoming trail maps. 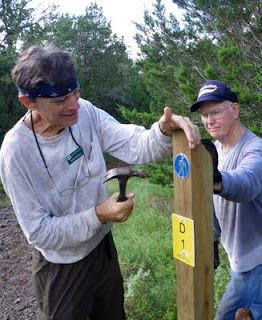 Learn more about the rescue in Austin and the subsequent installation of blazes in this story from a June edition of the Austin-American Statesman (http://www.statesman.com/news/local/barton-creek-greenbelt-trail-gets-markers-to-help-1549660.html). Spring Lake Preserve and Wastewater: Where Do We Draw the Line?